Day 3: Road to Huh? Shannon planned Day 2, so Day 3 was my choice. 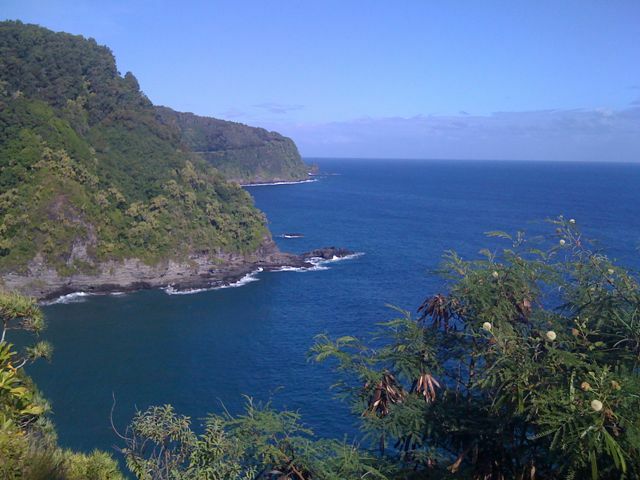 The guide books said that the Road to Hana was a must: a long drive through a lush rainforest. “Stop often, look at the beautiful views, swim in pools under waterfalls, and breath in the smells of guava and Ginger,” they said. 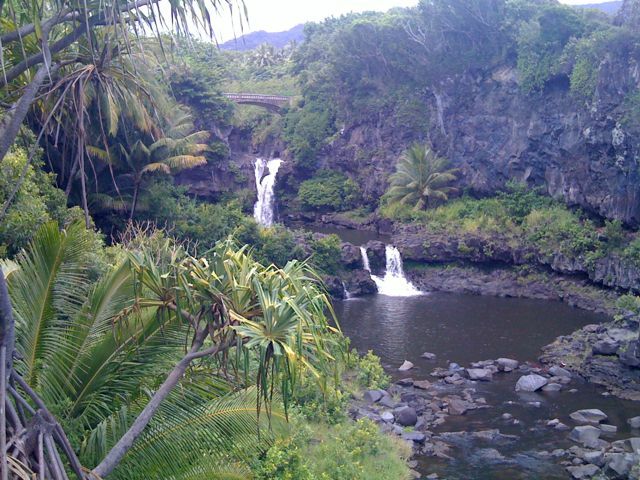 Plus, I had seen the Kipuhulu part of Haleakala National Park on Discovery Channel, where there are a series of pools and waterfalls you can swim in that come down from the mountain and feed into the ocean. Well I don’t know what road they were talking about, but that wasn’t the drive we did. 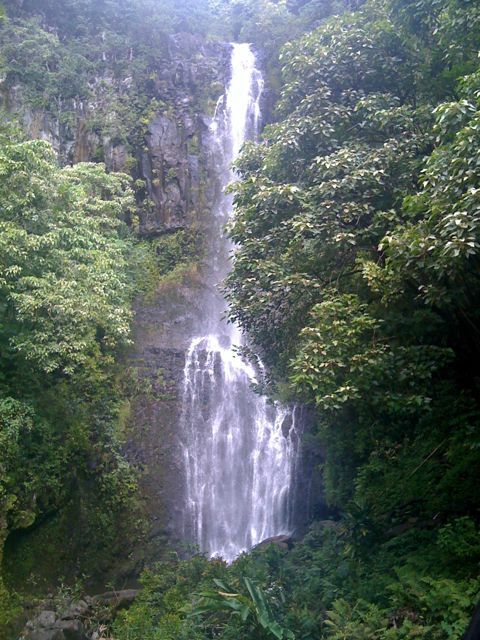 It was three hours before we saw our first real waterfall (pic below) and we only saw one other really good one later between Hana and Kipuhulu. And the views were okay but definitely not worth the drive. 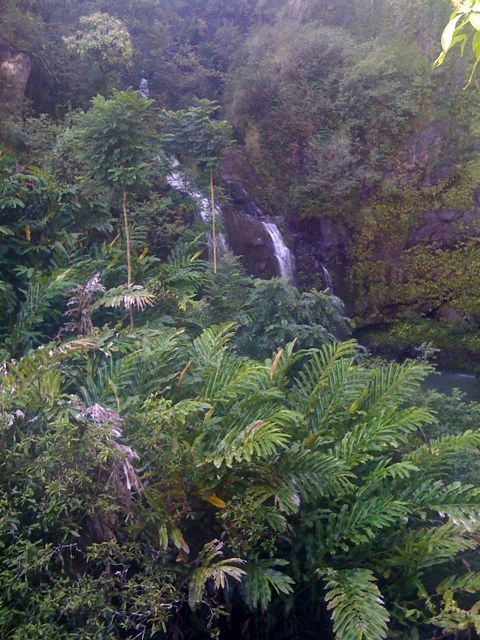 Still, there were the pools and waterfalls at Kipuhulu. Oh wait, except they close off the pools and waterfalls to swimmers when there is rain on top of the mountain because a flood of water can rush down the mountain and has killed more than a few people in the past. So basically, it was too dry for us to see waterfalls but too wet to going swimming? Huh? Thankfully, we left so early we got back to the hotel in time to spend most of the afternoon by the pool drinking lava flows, getting back to how Harry and Hermione were going to find You-Know-Who’s Horcruxes, and forgetting what a lame morning we had on the Road to Hana. Posted on 28 September 2008 by Nate Rosenberg. This entry was posted in Travel. Bookmark the permalink. Lame, he says. Do you know what’s lame, mowing the lawn while your friends are in Hawai’i! Glad you having a good time. In honor of your trip, I am reading by the pool, but unfortunately, nobody is bringing me drinks or snacks.